Sorry to keep on, but I do have this thing about Geoff Dyer. I love his writing. I love the relatively recent Abacus editions of his books. And I’ve just finished reading his late-‘80s London classic, The Colour of Memory. It seems awfully familiar in some ways. “DHSS bohemians”, happy-doing-nothing, thinking-they’re going “to do something”. Posturing and pontificating. Dissenting and dissembling. Dyer contemporaneously captured the spirit of a now lost age. With a better publicist, The Colour of Memory could have been a big as Generation X. Dyer is as good as a writer as Douglas Coupland. Scenes of people sitting on roof tops in South London sunshine, reading Calvino, listening to Coltrane, and saying nothing much, sort of suit me. Anyway, there’s a passage in the book, where one of the lead characters, Steranko, says: “Listen I’ll tell you how I’m involved in politics: I never eat at McDonald’s, I never play electronic games, I’ve not seen five minutes of soap opera on television. I try not to listen to pop music, I never listen to Radio 1; I don’t read the review pages of Sunday papers. I don’t buy any South African goods, I don’t own a car and generally I don’t spend any money on the kind of crap shops are full of. I’ve no interest in getting a proper job, and I don’t care if I never own my own house …”. While this spiel may have been deliberately self-mocking, it does sum up how a lot of people felt. Seventeen or so years on, and it’s probably harder to think of any reason to listen to Radio 1. 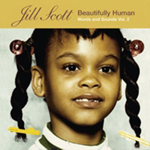 So I don’t know if people there are playing the new Jill Scott record to death. But it does sound like perfect music to play on the roof any evening at the end of summer. It’s a very lovely, soulful record. I am playing it to death, and it’s bearing up well. I don’t know much about Jill Scott, to be honest. I know she’s a part of the Philadelphia nu-soul sort-of-scene. It’s the sort of label that can be a kiss of death. But I still go weak at the knees when I hear certain Alicia Keys songs. And this new Jill Scott record makes me go very weak at the knees. It’s collaborator-free, embellishment-free, sort-of-stripped down, and quality all the way through. Interestingly it’s called Beautifully Human. And, yes, it is beautifully human. Warm and tough and vulnerable and independent and thoughtful and fun and friendly and wise, and quite beautifully human in the nicest possible way. It begs a question. How many records have titles that describe the contents? Some of the old jazz records managed it. Some of the Blue Note classics managed it. Good onomatopoeic names. Midnight Blue by Kenny Burrell. Inventions and Dimensions by Herbie Hancock. Black Fire by Andrew Hill. The covers too caught the mood. Ask me my favourite artist, and I’ll say Reid Miles. That sounds like a Colour of Memory flippant answer, but I’m serious. He’s the guy who did all those old Blue Note covers. Can you think of any better? Talking of covers, I can’t believe what Teena Marie is wearing on the front of her La Dona set. But don’t let that put you off. Lady T is back to reclaim her throne, and on the back cover she looks stunning. What is she now? 47? 48? Wow! Even better she sounds in sensational form. We’d be turning somersaults if Paul Weller or Edwyn Collins, say, sounded this contemporary, turning tricks in the most modern r’n’b way. There are too many collaborations, too many tracks, in the tradition of r’n’b recordings, but when the ballads hit the target you’re going to find your heart melting. Listen to 'My Body’s Hungry', and I defy you not to feel hot under the collar, and disdainful of those pouting prima donnas prancing around in their hot pants and halter tops. Off and on for the past 25 years Teena’s produced the greatest pop music of the day, and it’s lovely to see her still deliver. Sweet seraphim, resonant with wisdom, as she spectacularly displays in the wonderfully absurd sleevenotes: “OG proper-Siddhartha-baptised by flames …”. And so on. Wonderful! For isn’t it those sort of little absurd touches of magic that make life worthwhile?